Major League Soccer club Seattle Sounders have announced the arrival of Spanish winger Víctor Rodríguez from La Liga B club Sporting Gijon. The 28-year-old had started training with the Sounders on Monday, but the move was kept on hold until all paperwork had been finalised. 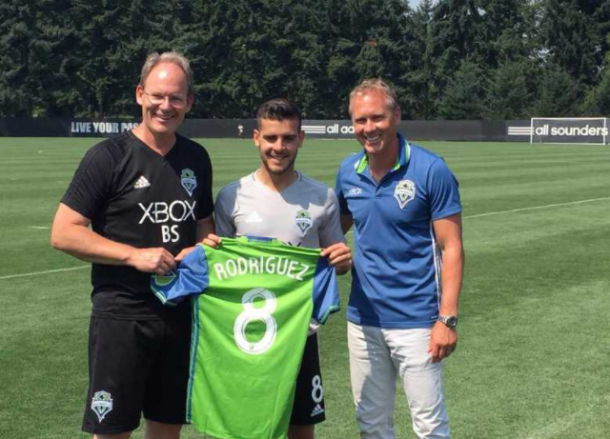 Rodriguez becomes the Sounders’ second recruit of the transfer window following the signing of Dutch full-back Kelvin Leerdam on July 1. Rodriguez has spent his entire professional career in his home nation where he has racked over 230 outings for Badalona, Vilajuiga, Zaragoza, Elche, Getafe and Sporting Gijon. The Spaniard had been closely watched by sporting director Chris Henderson over the past 24 months, and club president Garth Lagerwey is pleased that the attacker has been added to the squad. Although the club have shown improvement from their early season form, the Sounders found the right full-back and left-wing spots the most unsettled. Lagerwey hoped that certain players would step up to the plate but it did not happen, and it was the prime reason for their summer spending. Sounders’ new signing Rodriguez comes from the famous La Masia academy of Barcelona which has produced several world-class players including Lionel Messi, Andres Iniesta, and Xavi. He spent four years in the youth ranks alongside current Barca ace Jordi Alba, who were both released for being too small.